Frame tents are large tents that have been around for a long time. They are practical and predictable structures that provide an excellent weatherproof shell but can fall a bit short on the aesthetic side. 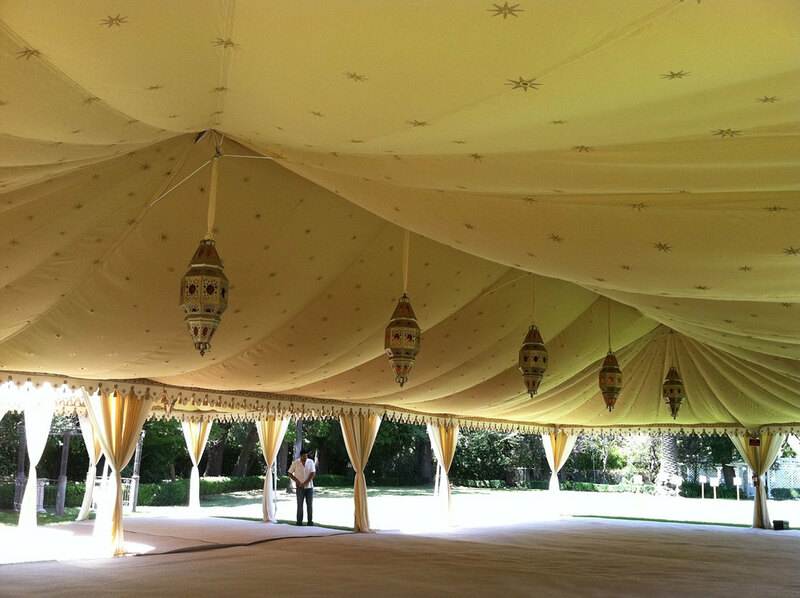 Raj Tents' exclusive range of linings for frame tents remedies this deficiency in true Raj Tents style as a solution for large event tents. Our frame tent linings are cut to provide a luxurious drape and volume of fabric to create a dramatic interior setting. Most of our frame tent lining sets feature our gold star print, with mirrors embroidered into the centers of the stars for added effect. The scalloping valance establishes a strong horizontal line and brings in color to support your theme with drapes further developing the color scheme. 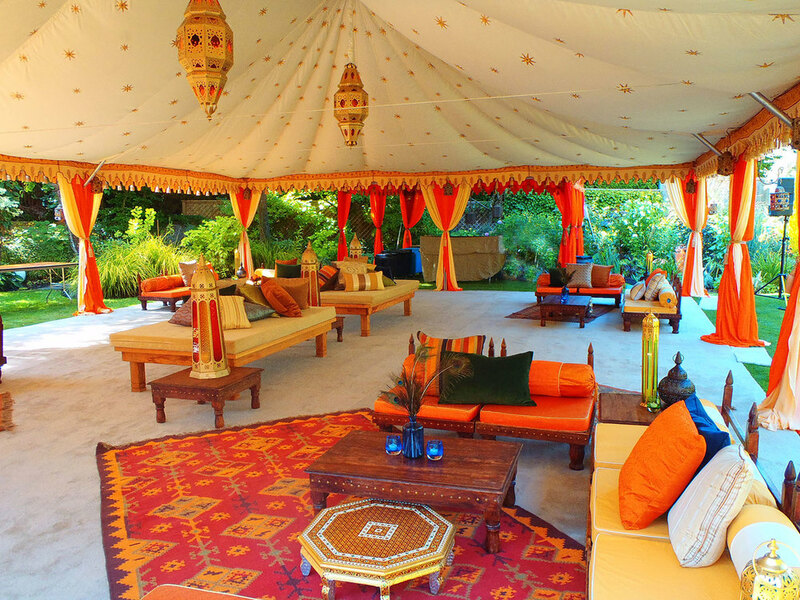 Raj Tents has a diverse range of walls for frame tents, from classic walls in cream, through printed or striped walls to highly decorative arched walls. The latter being an excellent way to break up the boxyness of a large rectangle by adding curves, these are particularly appropriate for Middle Eastern theme events and Indian wedding ceremonies and receptions. For even larger tents, the Losberger type model is engineered to span a greater width and is the structure of choice where high winds, rain or snow threaten. Raj Tents have recently developed a range of linings for these structures and will be adding more colors in the next year. As this style of tent is a barn ended large tent, the interior is higher at the ends and the lining is closer to the tent roof, allowing for more lighting treatments than a standard frame tent.